It’s been a long while since I have done a review…so this is way overdue and I promise to keep it up from here on out. Plus I need more inspiration for my cooking so this is serving dual purposes. 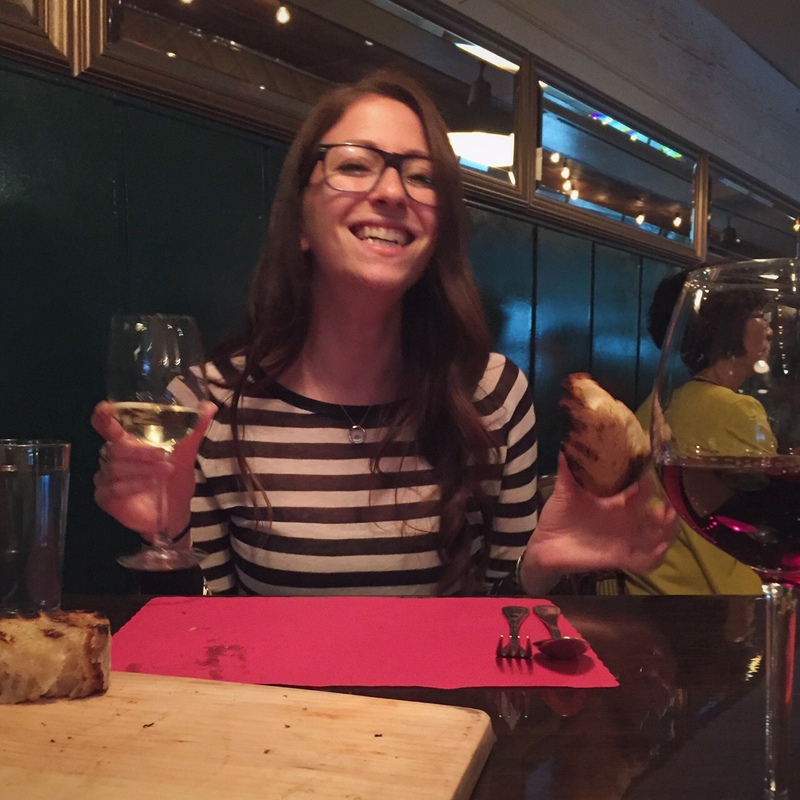 Here’s what you need to know about Little Sal’s Italiano: it’s a cute and casual spot in Union Square. 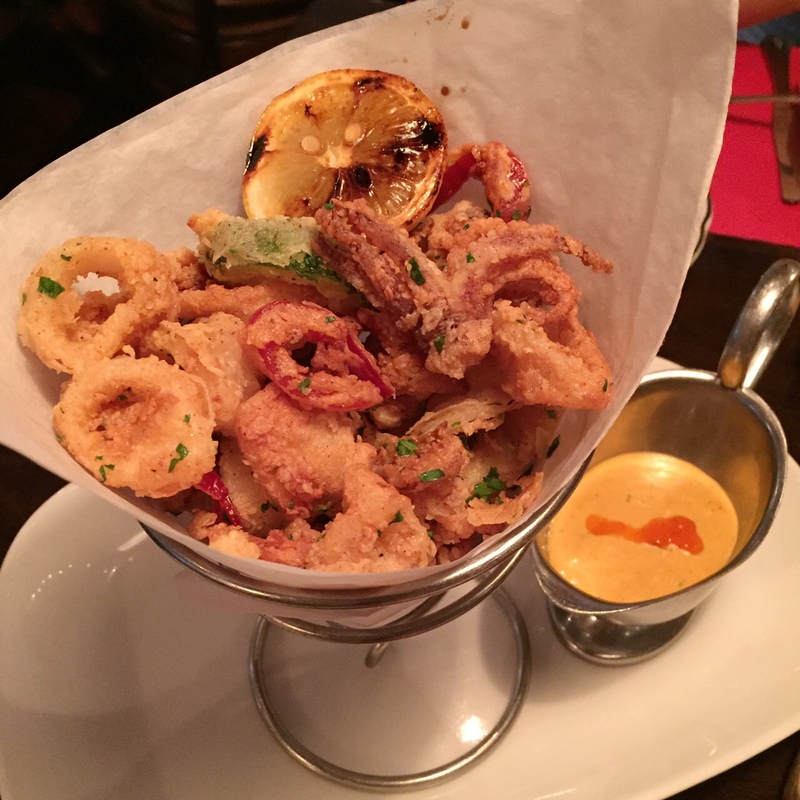 It’s great for catching up with a friend or two over a glass of wine and some apps. It’s got great service and a friendly, knowledgeable staff. It needs a little work on it’s red sauce. I’ll explain. 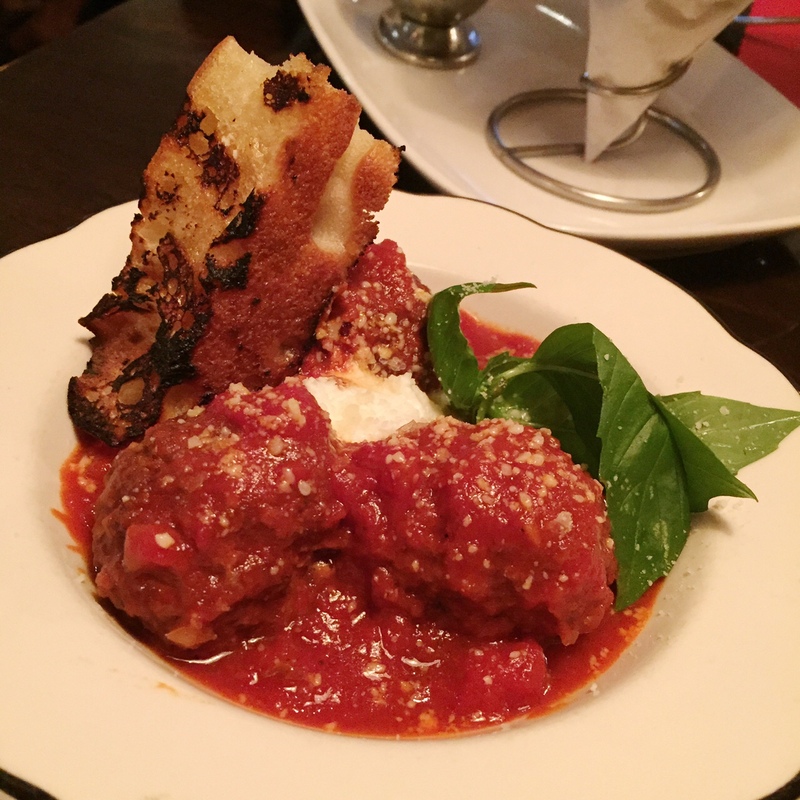 The meatball appetizer comes in a “red sauce” with fresh ricotta and some golden buttery slices of grilled bread. Actually they give you this same bread to start with and it is heavenly. 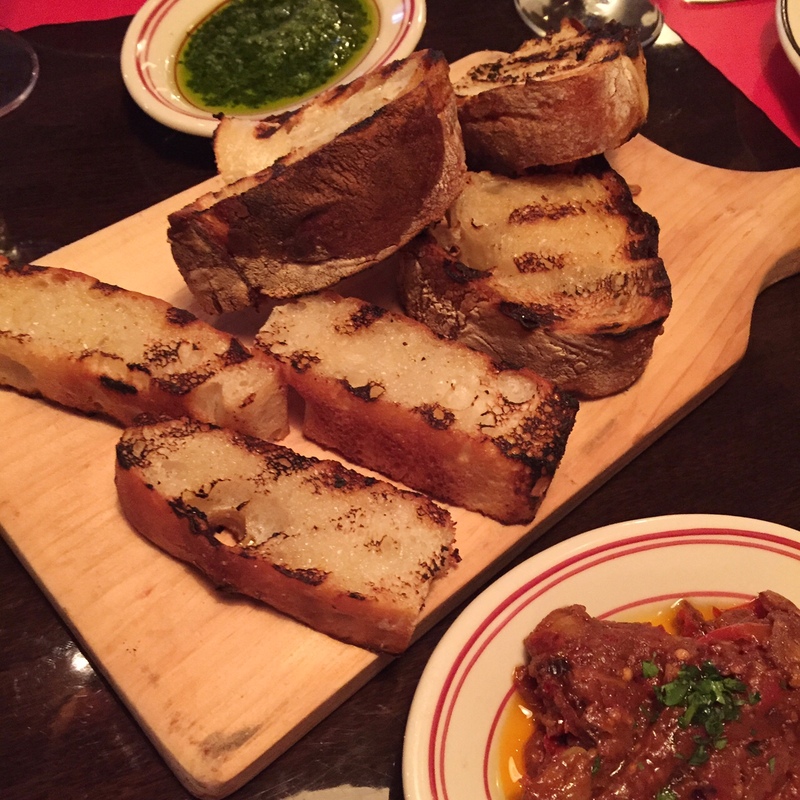 Served with eggplant caponata and a “nutless” pesto. So all of you nuts who are allergic to nuts…go nuts! HA. Anyway back to the meatballs. The “red sauce” in this dish is great and that is for one reason: MEAT. The sauce had the porky flavor from the meatballs (which were very tasty on their own), so those went very quickly. Now, the “red sauce” served with the eggplant parm and my pasta, however, not as good. Needed a little something and I think that little something was a nice piece of pig simmering in it. 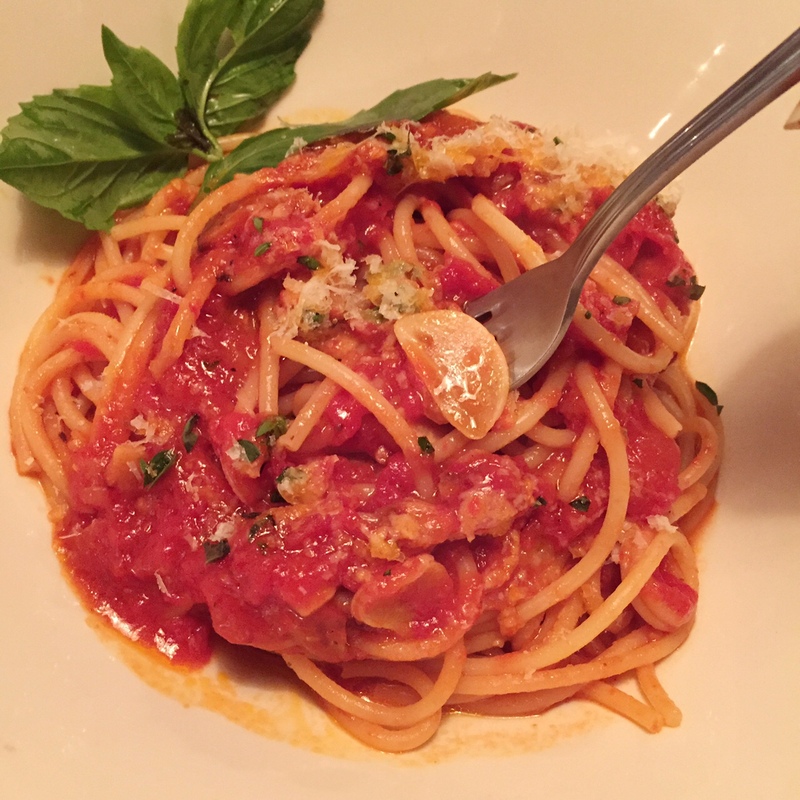 If it’s at all possible, I would ask for the meatball sauce on my pasta moving forward. I tasted that difference for sure. The fried zucchini and calamari was fried to perfection, and served with a spicy mayo-like sauce and that went real fast too. I mean, how wrong can you go with deep fried ANYTHING?! You can’t. Light, crispy, and delicious. So here we are again with the red sauce. First off, the bucatini was definitely lacking in the bacon department which was a bit upsetting to me. But the red sauce could have made up for that, had it been similar to the red sauce of the meatballs. Still good, but not as good as it COULD be. It did have big slices of fresh garlic swimming in it though, and I LOVE garlic, so this made me happy. 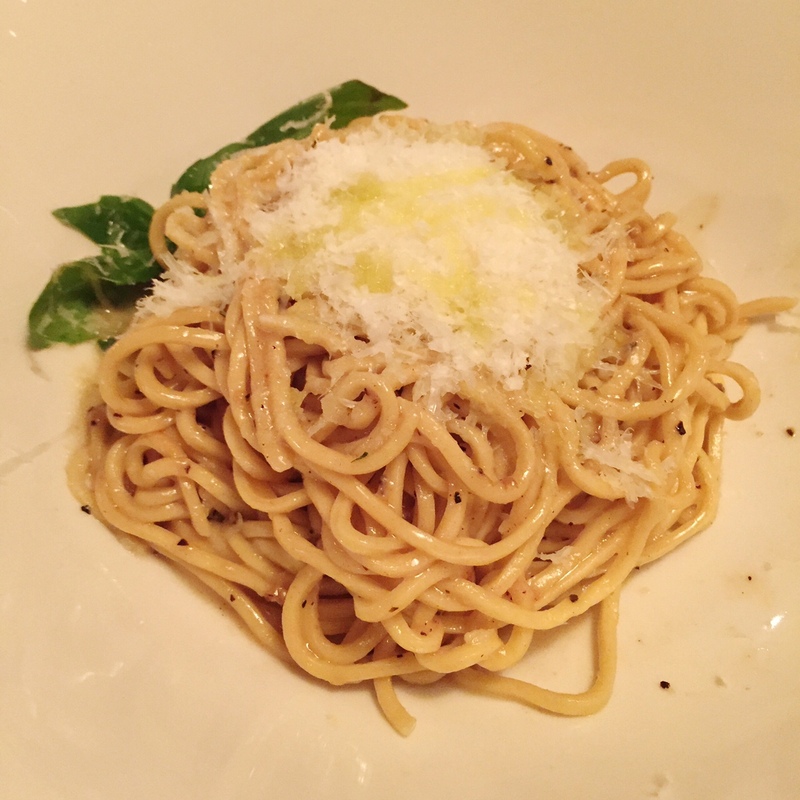 The cacio e pepe – a traditional Roman dish, this is one of my favorite pastas to order. So simple and so tasty. This one was good, but not the best I’ve had. Nice helping of pecorino romano though, and you know I don’t hate on that cheese game. Note that this is NOT parmigiano reggiano, but pecorino, which is a bit saltier. Nom. 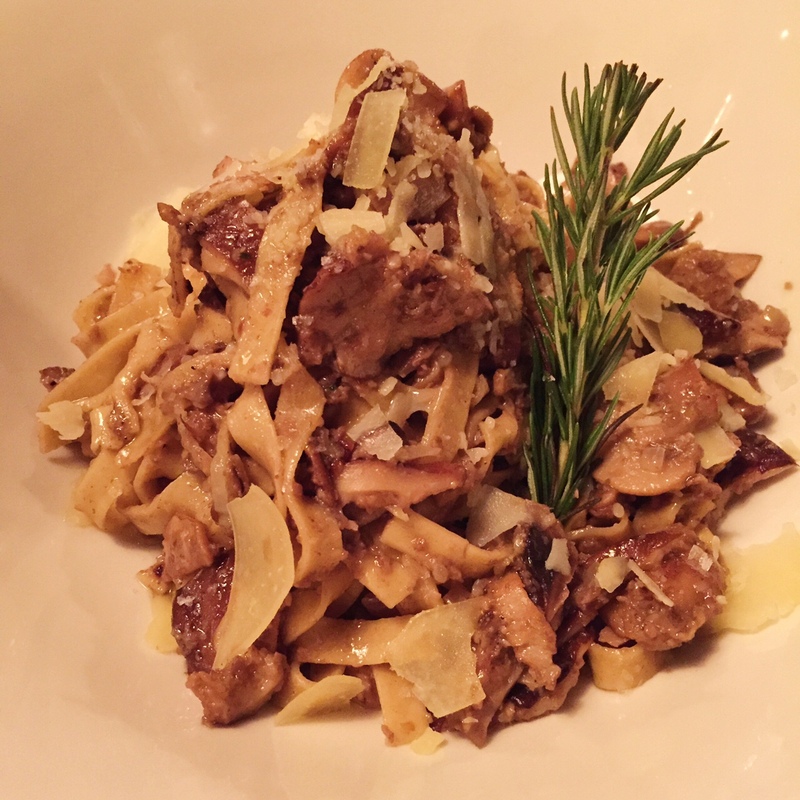 The winner here is obviously the pappardelle. A delicious truffle-butter-bite comes through with the super tender mushrooms and cheese…it’s heaven. I would have a hard time NOT eating that one if it was in front of me. Home run on this one. 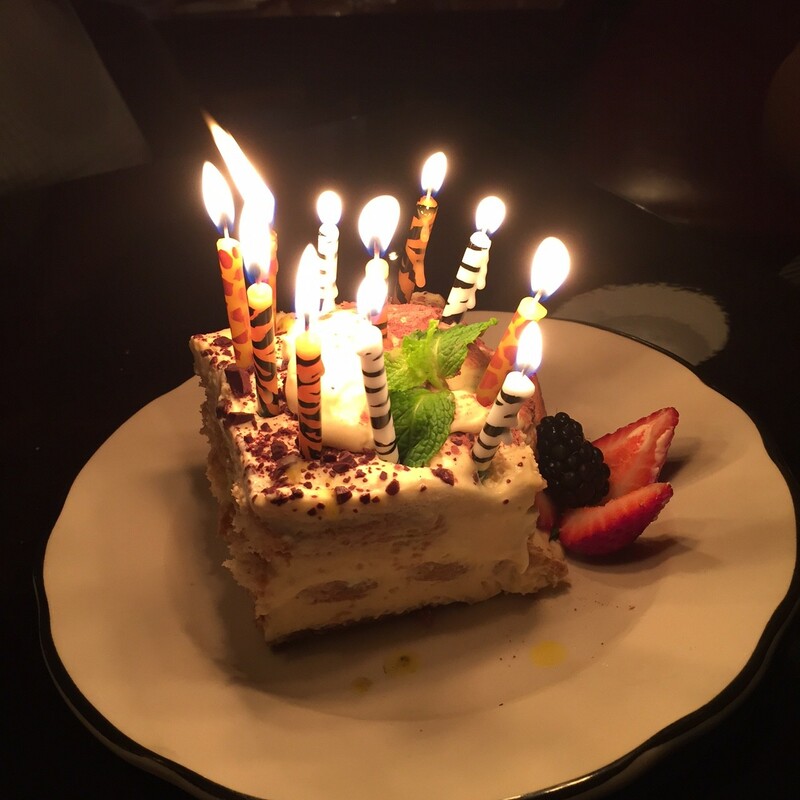 We BARELY had room for dessert, but managed to scarf down a bit of the tiramisu (complete with candles for a special birthday gal!) which was very good. 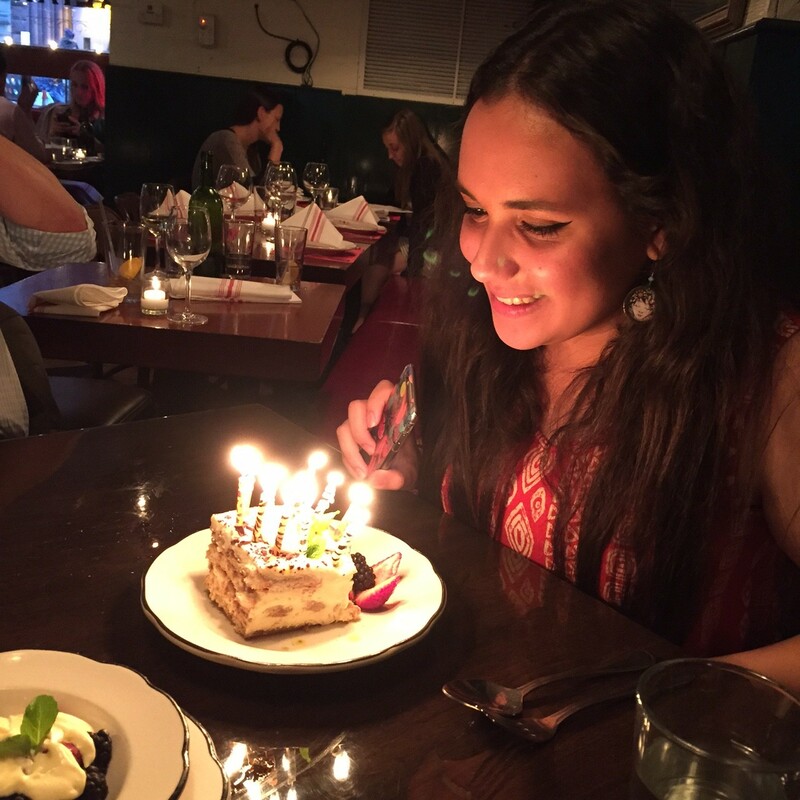 And happy birthday again, Nina! We also had the zabaglione with fresh berries, which was delicious. One of the better ones I’ve had, honestly. No pictures of the zabaglione though, because I’m not going to lie, I had a pretty significant wine buzz on by this point. See below. Can’t take me anywhere.